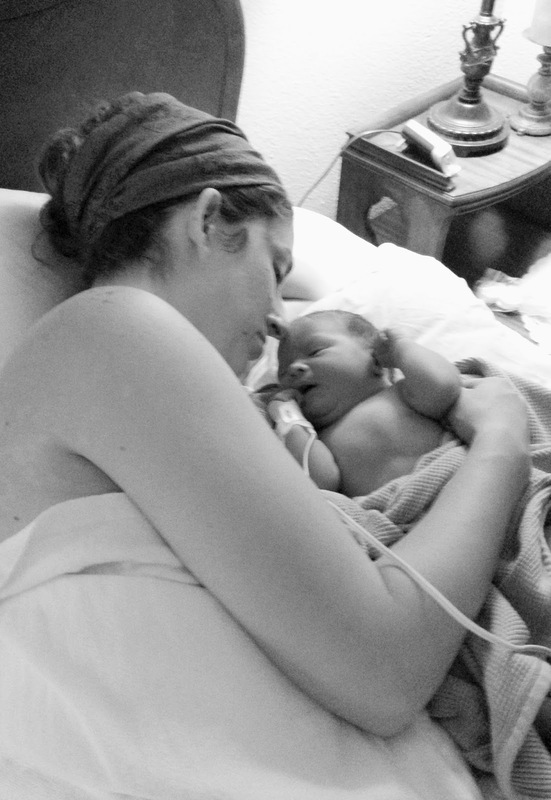 After adopting her first child, here is the birth story of Shannon’s first biological child. On December 16, 2013 – exactly a week away from my due date – Eric, Alyosha, and I spend the day at a Curious George exhibit at a nearby museum. It was Alyosha’s adoption anniversary (his “gotcha day”) and the only day that I had fervently prayed to not be delivering his brother on. Neither one of them needed to deal with THAT dynamic their entire lives. We go to bed that night, happy and relieved by the lack of uteral activity, but in separate beds because at that point ain’t nobody wanna be sleeping with Big Mama, her smashed bladder, and the capillary waves produced by Her Highness rolling over every 12 seconds. At 4 a.m. I wake up. Was that –? No. Surely I just peed on myself a little. (Let’s be honest, it happens.) Didn’t they say in the birthing class that most women’s water actually doesn’t break before labor begins? That Hollywood has played us for a fool for the sake of cinematic drama? Well, better go to the bathroom anyway. It has been 45 minutes. Thoughts running through my head as I make my way to the bathroom: Can this really be happening? But it’s a week early; first time moms almost never go early. Should I wake up Eric or let him sleep? Should I call my mom? Should I call the midwife? Maybe it’s just pee. It’s definitely not pee. Maybe I should smell it? Nope, not pee. I think this is really happening. But it’s a week early! That’s impossible. I haven’t even gotten to the “I hate everybody and everything” stage yet. Should I wake up Eric? I should sleep, I should try to sleep before contractions start! That’s what I should do! So I go to bed and (go ahead, laugh) try to sleep. Shockingly, I am unsuccessful. So at about 4:45 I wake up Eric. Waking him up and telling him that my water broke and that we’re going to have a baby is every bit as fun as I always imagined it would be. We call the midwife. Since I’m still not contracting, we arrange to meet at the birthing center at 8:30. I call my parents, who are in East Tennessee (we were in Texas). I already told them days ago to have their stuff packed and ready. I deliver my news gleefully. They are dumbfounded. Their stuff is decidedly NOT packed and ready. They freak out and have to go. I’m not sure what Eric and I do for the next three hours but: something. At 8:30 we’re off to the birthing center with three year old Alyosha in tow. He is interested, but not thatinterested. Because I’m still not dilated or contracting, the midwife strips my membranes and pulls down my cervix and I want to curse the world and die. So now, tra la la, we’re free to go and come back in the afternoon. We go to a nearby breakfast joint that we lurve and I eat a super yummy granola/coconut milk bowl. (Heck yes I remember what I ate.) Then I start contracting. It’s probably about 10:00 a.m. I walk around the parking lot for a few minutes, because it seems like something women in labor should do. Then we go home. The midwife had told me that pumping would get contractions going, so my dear friend Bonnie came over with her pump and gave me a tutorial. Colostrum! Lots of it! I was so proud. Eric came in and was all, “that’s it?” and I was all “get outta here YOU KNOW NOTHING.” Turns out, I knew nothing because why was I pumping to create contractions when I was already having contractions? They start coming strong and steady, just 3 or 4 minutes apart. At 2 p.m. we head to the birthing center, contractions about 2.5 minutes apart. I labor for awhile at 5 cm, still feeling good in between, chatting with the midwives and assistants. There is one other girl there with her husband, laboring in the next room, who tells me she’s been in severe pain all night. I thank my lucky stars that it’s going faster for me, and will laugh a hearty nonlaugh over that later. Blah blah blah, when I hit 6.5 cm they finally let me get in the birthing tub, which is awesome for a little while and then BACK LABOR DEAR GOD THE BACK LABOR and tub or no tub really doesn’t matter anymore. Eventually I throw up in the water and have to get out anyway. This part of labor is a blur and all I remember is the vomit, the exploding back, and saying “Christ have mercy” over and over again and telling my husband “I can’t do this” no fewer times. Eric is a precious little first timer, eyes wide, assuring me I can, and praying with his rosary beads beside me for hours. When I get out of the puke, I am at a 7. TWO HOURS for half a centimeter? There is no shred of justice in the world. My angel midwife offers some pain reliever and I jump on it, but can not tell ya what it is for the life of me. (I don’t exactly have strict standards at this point.) Mercifully, I am able to sort of half doze for 30 minutes or so before they rouse me and get me moving again. Before long, I am pushing. Unless your baby’s head is turned really weird and can’t get passed your pelvic bone. Then pushing means nothing except a lot of screaming. Homegirl in the next room delivers, they cheerfully tell me. They’re monitoring Moses’ heart rate closely and he’s happy as a clam in there. No state of emergency here except for the fact that I cannot physically get this child out of me. Finally the midwife tells me that she needs to cut an episiotomy and if that doesn’t work, we’ll transfer to the hospital. I am NOT going to the hospital. Not because I don’t believe in them, I do! (I do, I do, I do!) I would have been fine with going three hours ago but at this point NOPE. This baby is coming out of me RIGHT NOW or else I’ll… well I don’t know but I can be awfully bull-headed when I wanna be. Eric cuts the cord looking like he’s been run over by a truck, they sew me up, Moses nurses immediately, and my parents are able to come in moments later. It is perfect. Terribly imperfect but so very, very perfect.